A hyper-extension finger goniometer that can be held and operated with one hand. Measures extension / hyperextension and flexion of the digits from the dorsal surface of the hand for increased accuracy. 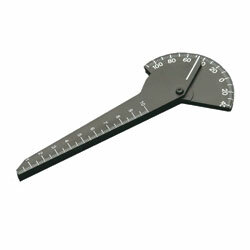 Protractor measures 0-110° in 2° increments. A 10cm scale (millimeter increments) on the grip allows easy measurement of fingertip-to-palm distance. Prominent and easy-to-read grading. Latex free.